"Building bridges just to knock them down"
MC Esher became a phenomenon by creating artwork that looked like mind bending puzzles but all at the same time had an easy explanation. The Bridge is like an artistic monument to Eshers cause. The game involves you in control of a lonely professor who happens to unfortunately fall asleep under the wrong apple tree at the wrong time before getting knocked on the head by what would appear to be a very heavy apple. After the blow to the head, the professor walks home and through a door way marked with a lone I and thus here is where the games challenges begin. From this point onwards the game starts to involve mind bending puzzles where the games playing surface, whilst at first look appear to be a perfect 2D layout, you soon learn that the games landscapes are 3D and take part on front and rear axis for the most part. It is being able to identify these different plains of landscape and work out how to navigate the mazes I guess you could call them which is what gives this game the most challenge. Things start off pretty simple by showing you the basic ropes of the game including being able to turn each level on a perfect rotary motion if you need to before gradually cranking up the pressure and difficulty the further you get into the four main chapters of the game. If you are by far a puzzle wizard getting past the first four chapters may seem to be an accomplishment especially with all the gameplay tweaks that get thrown at you from playing around with different plains of gravity to avoid objects or lure things you’re way so you get a clear route to the exit path. Once you complete the fourth chapter the real challenge begins. This time the game essentially repeats itself, same locations and chapters but with a slight twist, you are plonked into the mirrored dimension where the levels indeed may look the same, but there will be major gameplay changes compared to the first time you transversed the levels. It isn’t just a case of retreading what you did previously in reverse. The gameplay really is fun and it will take many people a long time to tinker with various levels and work out the easiest ways to solve them. Sure guides exist from previous versions of this title, but where is the fun in using them when you can try to solve everything yourself? To the mere naked eye graphically the game could be proposed as being ugly, but when you are creating multiple layered level designs that are generated to trick the mind, I think the art style is beautifully done. Sure it may all be in black and white apart from the very few times you get put back into a colored universe. But the way the graphics look like they have all been sketched out is quite unique to look at. Sound design is also another strong point to this title, with each level having ambient music playing in the background and at a low enough level to keep stress levels minimal whilst you try to solve the next puzzle. Apart from that, the sound design of the game is kept to a very minimal effort which works in the titles favor. You get the tapping of the professors shoes has he walks around the levels being productive, and also the sound effects of keys coming loose, doors unlocking oh and the menace balls has they hurtle towards you trying to take you out before you reach the doorway. The game contains twenty achievements and you can obtain these from doing a multitude of different things within the game. Some achievements come from just natural progression and beating each chapter. Whilst some of the others will require a little more thought because you will have to meet a set criteria within a certain level. This could be something like beat a level in a certain number of character switches, to beating a level without walking and using only the rotate feature. There is one achievement for finding the games seven different collectibles, but realistically nothing is too far out of reach depending on if you are willing to spend enough time with the game to master the levels and the different ways to tackle the levels. So this brings us to the question do you try the game out? If you are new to the game and have never played it on a previous console or PC then yes, this is a very unique title and one that will be hard to recreate, sure it can get difficult in places but the way the game plays with the mind and makes you think outside of the box is unique. If however you played this on the Xbox 360 then perhaps it might be better then to stick to the game on their. Everything in this version is the same bar for graphics have been slightly up scaled. But levels aren’t slightly different and essentially is just the same game. 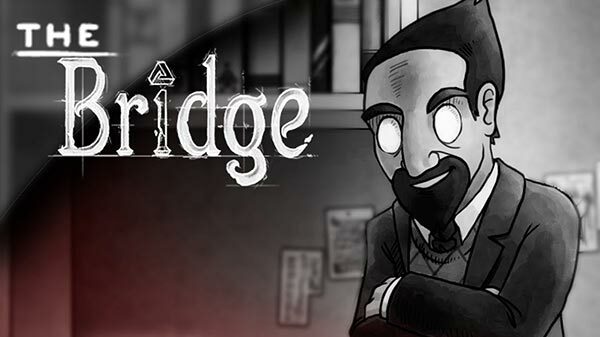 The Bridge is a fun unique title, and in all honesty I hope the small indie team go on to create a possible sequel or another game in the same vein but with a different idea on how to approach puzzlers.